Race Driver: Create & Race's menu system (which scrolls horizontally) has "Multiplayer" on the main menu and "Single Card Play" on the following menu. The opening credits are average length. Download time is also average, but it's split into parts. The menu options themselves were far too oversensitive, mistapping if the stylus is off by even a single pixel. The only surefire efficient way throgh the menu system is to use the Nintendo DS' buttons. The controls (in Automatic, which is the default for the host and the only option for guests) are easy to pick up and are intuitive. Like Suzuki Super-Bikes II: Riding Challenge, drifting is practically taken out of the equation, leaving high-speed cornering as the most difficult maneuver to be mastered. The driving physics are spot on to what they should be without fail. The button controls feel natural and the basics can be picked up successfully without looking in the instruction booklet. There are no touch controls in the gameplay (there are in the menu), but they're not needed. The 3D look is excellent for a Nintendo DS game. The sense of depth isn't as natural as everything else, but it isn't a huge problem. Audibly, the game's sounds not only add mood, but inform you as to what other drivers are doing. The game's Single-Card Download multiplayer features eight different courses that can set in a championship list of up to fourteen tracks (with each track listed as many times as desired and in any order combination). Eight different car/driver combinations are available to drive/as. There are a lot of Single-Card Download racing games available. In fact, this is the tenth car-related racing game reviewed on this site, and there are plenty more out there already, and more still are on their way. For a racing game to really get noticed, it needs something the others don't have. Some of the kart racers have familiar characters, like Mario Kart DS and Diddy Kong Racing DS. Some of the simulation racing games are part of an established series, like Burnout Legends and Ridge Racer DS. 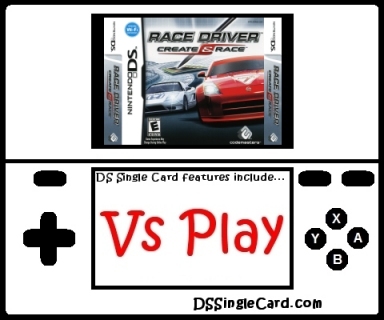 Since Race Driver: Create & Race didn't have either, and since Firebrand and Codemasters were determined to make a great racing game, they decided to do something unheard of for a Nintendo DS racing game (or almost any video game racer): they created a fully flushed-out race track creation tool. Unfortunately, since the Track Designer isn't involved in the Single-Card Download gameplay, it can't be part of my review. Fortunately, that wasn't the only thing that Firebrand and Codemasters got right. In fact, there really wasn't anything serious that they got wrong. The gameplay is tight, there's a good variety of Single-Card Download-compatible racetracks and cars, and the setup allows multiple races per connection (up to fourteen). The game can be picked up and learned much more easily than many of its competitors, but is just as hard to master. Keep in mind that this is a simulation driving game, so there're no weapons or unrealistic cartoony effects like Mario Kart or Diddy Kong Racing DS, but if what you're looking for is a serious driving/racing game, you've definitely found one here, and a great one at that! Repair the touch-sensitivity of the menu system. Increase the accuracy of the depth perception while racing. Offer an option to set up a new list of races after the current list is completed instead of forcing a disconnection. Click here to return to the DSSingleCard.com Race Driver: Create & Race profile.